Nancy Antenucci of Between The Worlds LLC (www.betweenworlds.us) is a seasoned tarot reader as well as a teacher and negotiator of creative thinking. Her book “Psychic Tarot – Using Your Natural Abilities to Read the Cards” is a compilation of 25 years of her work. She founded Twin Cities Tarot Collective which produces a successful, annual tarot conference – The North Star, an innovative monthly Meetup and training for readers. For the last 10 years she has served on the creative teams as a presenter, staff, reader and performer of other Tarot conferences such as New York’s Readers Studio and California’s Bay Area Tarot Symposium. She is currently branching into creative strategizing for start ups and mid sized businesses such as the Plaid Penguin based in North Carolina. North Star Muse: As co-director of Theater and Ritual for the Reader's Studio each spring in Manhattan, what are you planning to engage in this upcoming year? How does this resonate with and branch out from how you've incorporated theater and ritual with tarot at past Reader's Studios? Nancy: I have hung up my crown as co-director at Readers Studio. I learned the most amazing things there trying new ideas out in front of one of the most appreciative and knowledgeable audiences a girl could ever have. I move deeper within as others shine brightly at RS. I have great memories but my favorite was embodying the May Queen for very nervous newcomers to RS during a late night initiation ritual. I am now working on surfacing a way to embody the essence of Tarot. I’m still kind of in the mad scientist stage. It takes a lot of alone time in a studio. I go religiously every Wed afternoon and do a number of things to see what manifests. I have always loved the world of Tarot. I am now bringing my body there. I think it goes far beyond the cards. I will be leading some Major Arcana embodiment training for Julia Hesse’s Living Tarot Oracle project this Spring in Portland. I also have my own form and structure of the Major Arcana as portals that will hopefully be posted online in 2017 . God knows our world could use mystery and magic that creates effective change. North Star Muse: One of the reasons you thoughtfully provide to get a tarot reading with you, on your website, is "to break up a chronic problem or pattern." How much of the readings that are given with this end goal in mind rely on practical advice, inspiration from your experiences with theater and ritual, and intuition? Nancy: I firmly believe that we are spirits having a human experience. We aren’t here to learn how to be spirits – we are here to learn how to be human. We incarnated into this one of a kind form. The essence of theater and ritual for me is the same. It is the exploration of an incarnation and expression of a particular form. We will never be here again…or this again. Spirit has no baggage while human beings inherit centuries of patterns of behaviors and beliefs of our own self worth. Most of us before the age of 11 have learned ineffective ways to either be truly loved or to love. Add to this mix that the game is rigged - gravity, taxes, death and neighbors. Hearing one’s own spirit can get lost or buried under all of this weight. I witness one’s spirit as best as I can. This listening has evolved into a structure of having one enter their House of Soul and speak to their various psyche selves.…the daughter, the lover, the high priestess, the assassin, the addict, etc. These are such strong energies that I perceive them as various actors. “They” can’t really talk to me but they can point to a picture or send me images. It is a sacred theater that happens within an inner landscape. I sometimes can’t believe what I get to do for my work. It is such an honor to see and support people connect to their true source of love. The imagery of Tarot helps me see the patterns, the pain, the old beliefs that need to be addressed. North Star Muse: Who or what inspires you to create (theater and ritual, tarot, spiritual mentoring, or what helped you complete "The Psychic Tarot Book")? Nancy: First and foremost, I really love Earth. I mean I have a total thing about Her. She is always muse. I think she kind of likes me too. I truly love to discover new ways to name and claim things. I love the pattern that is underneath the pattern. The only thing I like better than doing this process is sharing it with anyone who could use it as well. I had great hesitation in writing my book since I really didn’t think I had anything to add to the number of books out in the world already. I am grateful for my co-writer Melanie Howard. She was my student at the time. We kept each other going with lots of good Vietnamese food and laughing. Also I knew deep inside that the book would fly to the one person that really needed it. I secretly believe Ellen Lorenzi-Prince to be my human muse. I learn continually from Tarot of the Crone and the Dark Goddess Tarot. I’m about to embark on my next book which will be more about Creativity Spirituality. As you can tell, I’ve got a number of theories. North Star Muse: I define creative divination as inspiration via tarot, dreams, tea leaf readings, symbols and such, that ignites one to think, act, or create in a way that promotes contentment. That zen moment may be found in writing a new blog or poem, composing a new song, choreographing a new dance, or the revision of or return to an every day task. What is one way you find creative divination, and how do you think others can experience something like it for themselves? Nancy: Walking my dog. It is the best. She does her business and I slow down and talk to trees. I would highly recommend “The Artist’s Way” by Julia Cameron. It’s an oldie but a goodie in terms of excavating a true flow of creativity. How does the Earth inspire you? Please let me know what gives you inspiration, as spring awaits around the corner. Like many readers, Elle North at Drawing Within is a sort of life coach for the spirit. She breathes hope. I've witnessed her express excessive gratitude as she gains and shares a seemingly constant flow of healing wisdom and instruction on spiritual and psychic gifts. On your website, you state that "I hold your energy, embrace it, and remind you of your inner divinity." Can you elaborate on what this process feels and looks like to you? Can you give an example of what inner divinity means to you? For me, this looks a little bit different, depending on who I am working with and in which way I am working with them, In general, when I say that I am holding their energy, I mean that I am holding space for them and serving as a witness for what is manifesting within them - whether that is within their physical energy, mental energy, emotional energy, or spiritual energy. Whatever comes up for them, I totally embrace and honor - I recognise that we all have unique paths. As someone who feels a deep truth within the realm of non-dual tantra, which believes that we are all expressions of the divine, I help others to connect to their innate divinity - or at the very least, to remember their inherent spirituality - so that they can walk forward on their path with a sense of deep sacred inner connection with the world around them. Your Crystal Clarity service (which you kindly offer on a sliding scale) gives others "Something to work with. Something to unearth hidden parts of your highest self, your shadow self, your truest self. Something to help you heal, on all levels." What parts of *your* self does this service unearth? What are one (or a few of) the crystals you see a lot of your clients need in their lives right now, and what would you like to say about that? Within this service, clients fill out an intake form of sorts, sharing elements of their current emotional, mental, and spiritual aspects with me, along with their desires and intentions. With that wisdom, I intuit 3-5 different crystals that I feel would resonate with them, and share the metaphysical properties of these stones. When my clients are armed with the wisdom of these stones and their properties, it serves as a springboard point for them - they may purchase a necklace with one crystal, or carry another one with them in their pocket, or work with one in meditation. In this way, they are able to explore aspects of their unique self within their practice with the guidance and help of crystals - and this process looks different for everyone. They may feel empowered to shed light upon their shadow, or to recognize a shift that needs to be made within their lives in order to heal an emotional wound. A crystal that comes to mind as being one that I have recommended a bit recently is Tiger's Eye. This stone is absolutely wonderful because it is generally a grounding and protective stone, but at the same time it helps our sense of clairvoyance, intuition, and vision. It's a lovely stone to work with within one's meditation practice, for I believe grounding is absolutely necessary for working within the realm of the Third Eye and Crown Chakras, so that we can be connected to the earth as we rise up spiritually. This is especially true for brown and red versions of Tiger's Eye, where as Green Tiger's Eye also helps us to nurture our heart space and Blue Tiger's Eye connect us to our voice. Who or what inspires you to create (perhaps social media, tarot, reiki, or your pursuits around helping others shift and align)? I think that what inspires me to create is two-fold - one is my own practice. I like to share what I am working on within my own personal journey with others, and often that is what will inspire a program or offering. Another thing that inspires me is my inherent need to create and teach, as these two things are intricately entwined into my nature. I have always been creative and passionate about various projects within my life, and my background is in education - so it is sort of ingrained into my being to play with both areas in my life, and I am so grateful that I have the opportunity to do so in this way. I define creative divination as inspiration via tarot, dreams, tea leaf readings, symbols and such, that ignites one to think, act, or create in a way that promotes contentment. That zen moment may be found in writing a new blog or poem, composing a new song, choreographing a new dance, or the revision of or return to an every day task. What is one way you find creative divination, and how do you think others can experience something like it for themselves? One way that I experience creative divination in a way that you haven't mentioned is through my personal meditation practice. When I dive into meditation, whether I am just experiencing my breath or contemplating something or working with a mantra or mudra, I feel inspired and in awe of my body, my spirit, and the world around me. I think something similar that others can experience who may not be keen on meditating is the experience that one has when they go to a yoga class and get "in the zone" and find that sweet spot between ease and effort, between the thoughts and stresses, and dwell in a state of absolute contentment. Elle's Bio: I am a Spiritual Mentor who combines my wisdom of energy healing, goddess, intuition, tarot, and yogic practices to create unique offerings for soul-seekers. As an Intuitive Mystic, my work is to empower others to connect to their inner wisdom. An alchemist at heart, I thrive in a space where things are sacred and full of ritual. I am the creatrix of the Wisdom Within School of Intuition, and am also a Temple Priestess in A School for the High Priestess, which I co-created with my dear sister Sora Surya No. I am the author and illustrator of 108 Days of Sacred Intention, and the creatrix of Aligned, a Crystal Meditation Album. What crystals and meditations speak to you? Please comment with the meditations and crystals that aid you now. Tabitha Dial strives to help folks like you create your fate with tarot and tea leaf readings. She has an MFA in Poetry from Colorado State University and lives in Lexington, Kentucky. She is working on a creative divination workbook that encourages practicing tea leaf reading and can be used for any form of divination. Her poetry has appeared in articles on SpiralNature.com, in "Arcana: The Tarot Poetry Anthology", and in "Tarot in Culture" Volume Two. Desmond's captivating, eloquent spirit shows a devotion to sacred creativity. He's whole-hearted in his approach to tarot and offering personal advice and clearing the debris and creating bridges through the unique Pathfinding services at The Dreaming Bat. Patronus Divination is the art of summoning an animal ally to protect you from depression by reading tea leaves. Inspired by the Harry Potter Alliance, this blog provides quick instruction on how to read tea to call forth your patronus -- along with details on possible patronuses. 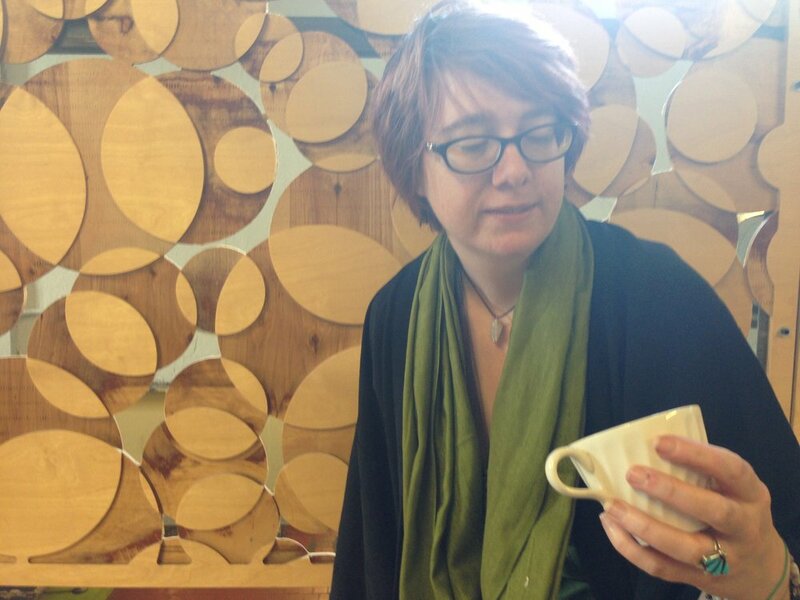 Meet Paige, a tea and folk magic practitioner, tarot reader, astrologer, and more.